this is part 2 of my earlier post, What Goes Around… where I offer a way out of the “food guilt” that we foodies may feel amidst the mass production of a plethora of foods and the slippery slope between following every new trend and being true to your food. I am a believer in moderation and practicality. For most people, the idea of living within the concept of the 100 mile diet is not something they are willing to do. 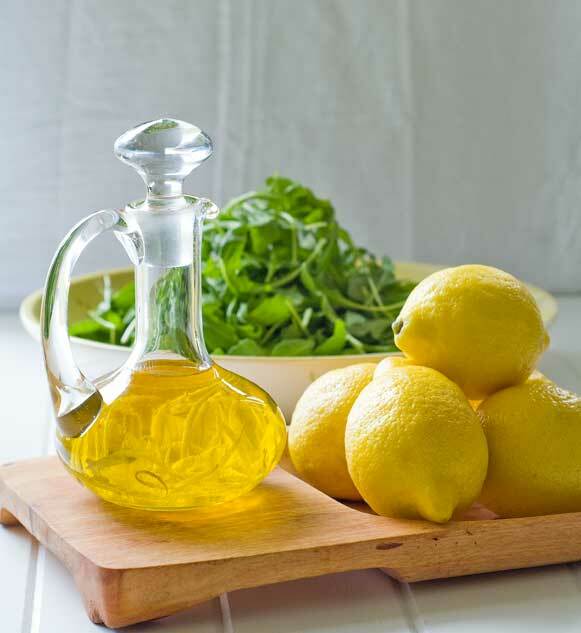 I know I enjoy lemons and coffee and olive oil too much to say I will swear off eating them. My husband says anything that is called a diet puts him off immediately (chefs don’t like being limited). I like the concept of Slow Food, that says you support local producers and encourage traditions to continue as part of everyday life in working towards a sustainable food community. 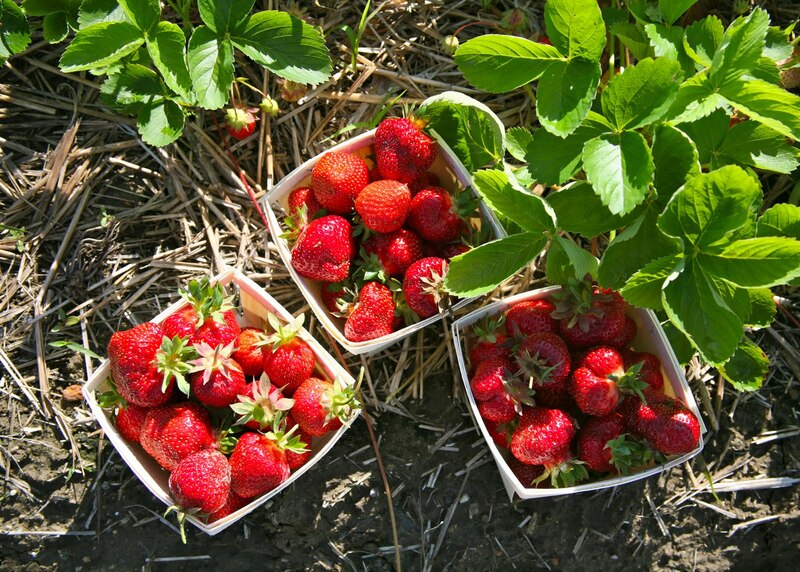 That can include supporting the local store that sells organic lemons and fair trade coffee and artisan olive oil, as they are likely the place that also sells local strawberries (instead of the imported ones shipped by the pallet-load) and other seasonal fare. I also think that education is crucial, and it happens to be another Slow Food pillar. We all need to understand our food – where it comes from, how it grows, what connection it has to our history and our future. If the only way we see food is wrapped in plastic, already portioned, then our education suffers from a lack of information. Children should know that bacon comes from a pig, not a grocery store. When they understand the pigs can live a happy life then maybe they don’t need to think they should be vegetarians because we are cruel to animals. If there is no sharing of traditional celebrations or recipes and their preparation, then our palates suffer from a lack of distinction in flavour. 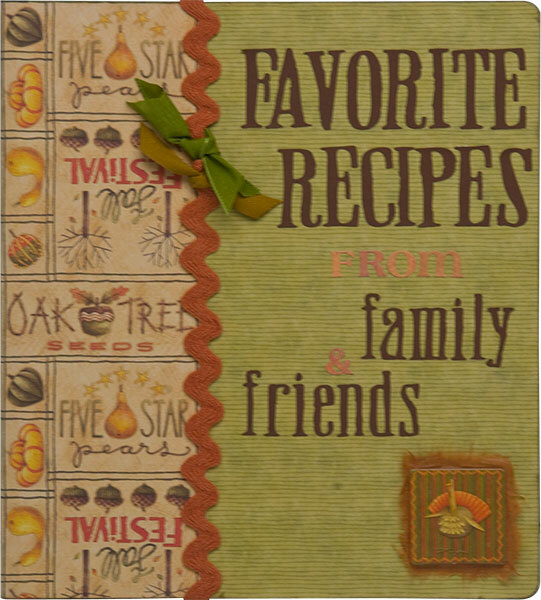 Grandma’s recipes should live for generations, and not just because they were published. Often the secret is in knowing just how to prepare a dish, or season it, so that it has that special something. We all deserve to be thrilled with our own food. Maybe I did play a part in creating the monster. Now that it has reared its ugly head, though, there seems no reason I can’t be of help in getting a lasso around its neck so we can train it to work with us instead of against us. If sharing my enthusiasm can include the encouragement for others to learn the whole picture and not just the processed one, then perhaps we can reach a happy medium. Everyone deserves to have access to good, clean, fair food – food that tastes good, and is free from unnecessary chemicals, and for which the producer receives a fair price. All these advantages are then passed along to the consumer, who is aware and supports all of these tenets. I am fortunate enough to live in a region where there are many people connected to the land, and happy to share their enthusiasm and their knowledge. Slow Food is a new organization in our community, but its philosophy is already alive and well here in the Okanagan, and I am proud to be a part of it. 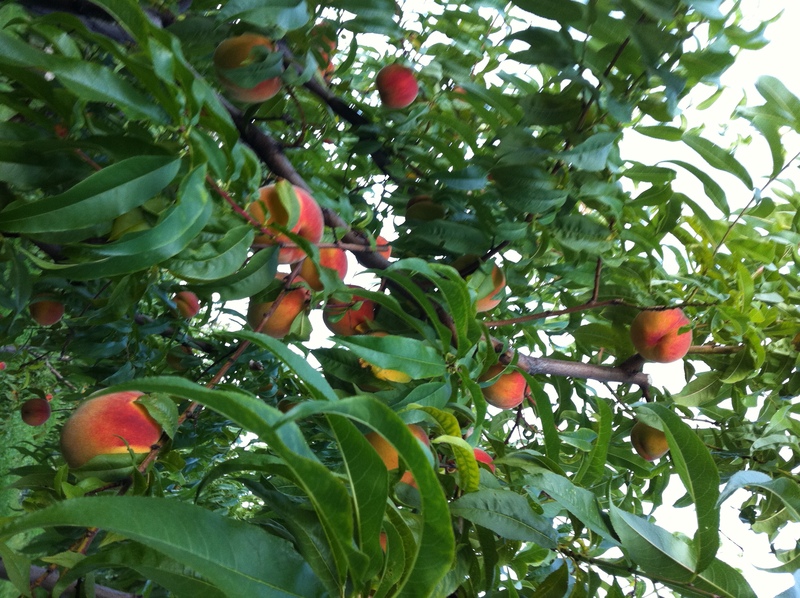 There is an orchard down the road from our house that is owned by the same family who planted it one hundred years ago (in the Canadian west that’s a long time!) 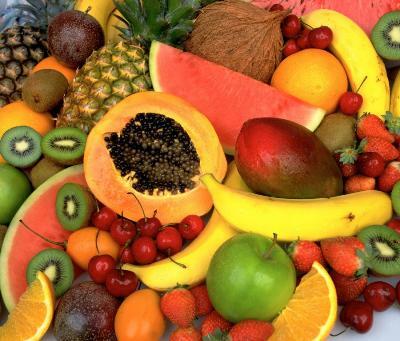 They sell the fruit at the fruit stand on the corner, and the taste of fruit picked that morning simply does not compare to the same variety packaged in crates and shipped and sold in a major chain store. In season, the fruit stand prices are close and sometimes even cheaper than the stores, but I for one am willing to pay a bit more for the taste of fresh Okanagan sunshine packaged that way. Maybe the extra pennies are like penance for my foodie sins, but I don’t mind – it’s worth every delicious bite! 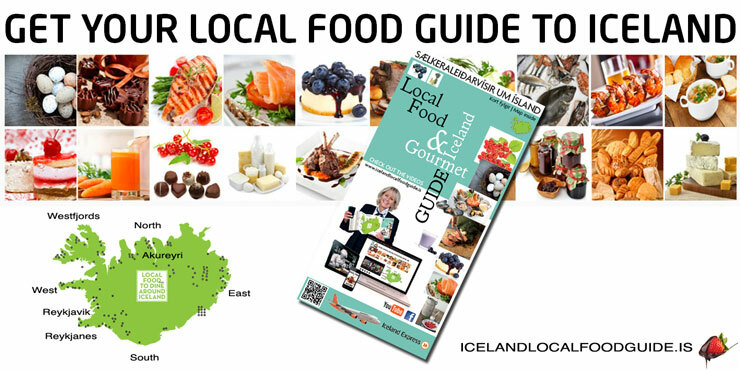 Do you have a favourite local food or traditional recipe? What is a delicacy where you live or where you come from?? I’d love to hear your comments. If you prefer Facebook, you can join me there too! 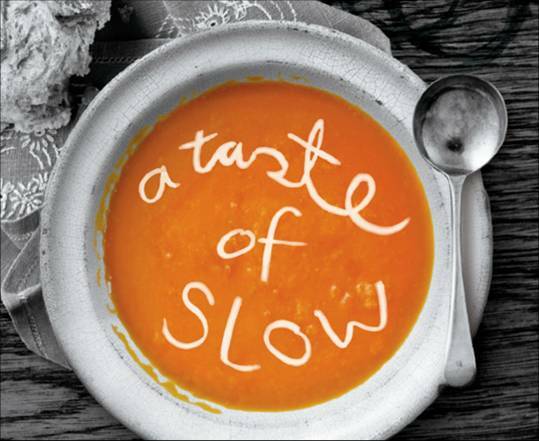 If you are interested to learn more about Slow Food, you can check out their fabulous website with many stories. There are convivia (local chapters) in over 150 countries, so I’m sure there are like-minded souls near you. If you live in my neighbourhood, you can follow Slow Food Thompson Okanagan on Facebook. I write about the passion I have for food – its tastes and textures, the variations that come with different spices or cultural evolution, and how it affects the rest of my day. All this seems normal to me but every once in a while I do remember that there are people who don’t relate to food in the same way. For some, food is really just a means to an end; eating a meal is just a fuel stop. But I don’t think that means they don’t enjoy the experience, perhaps the company or the memory that might go with a food item. After all, Tim Hortons TV commercials wouldn’t be nearly as poignant if they just showed people drinking coffee without showing us where they are or who they share it with, would they? So am I a food snob ? Did the enthusiasm from foodies like me inspire the market to offer exotic ingredients on a more regular basis?? Am I to blame for the impression we have as a society that the value of food is only as much as the latest grocery flyer says? This may sound like faulty logic but I have started to wonder if we are reaping the harvest sown from our own greed. When I was a kid, many of the foods that are imported from faraway places were rare, expensive, and only seen at certain times of year. papaya, coconut, kiwi, mango, even cherries were a delicacy when I was growing up. Gradually it got easier for those foods to become more common on grocery shelves; the world got smaller. And then stores got bigger. And then prices dropped and you could buy a pineapple for $1.99 or kiwi 3 for a dollar. 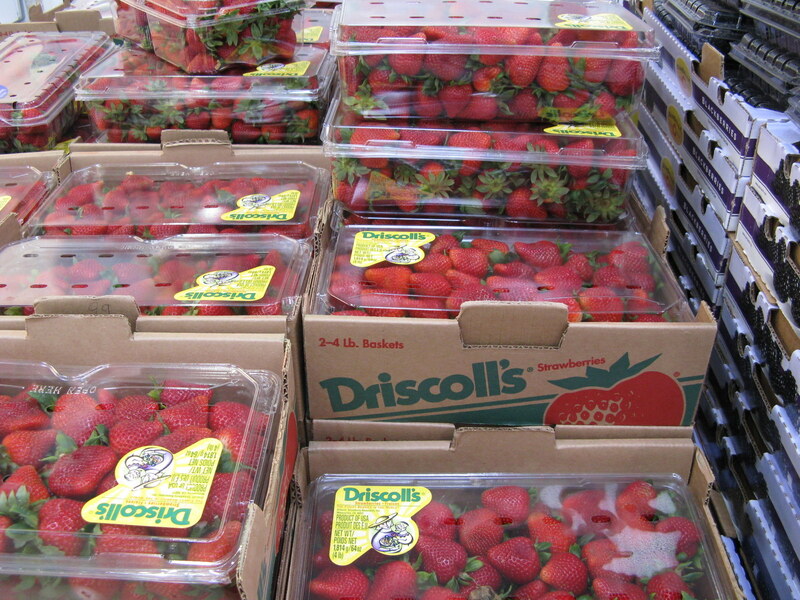 Pretty soon it was cheaper to buy a plastic box of strawberries from Mexico or Chile than it was to buy the ones from the local farmer’s market. Now you can get just about anything you want – ingredients or prepared food – at Costco and places like it. So, does this go against the philosophy of supporting your local farmers? Am I committing a foodie sin if I shop at those big box places?? Today is my goddaughter and namesake, Julia Kristin King’s 21st birthday. In honour of that auspicious occasion I wanted to post a commentary on how food is such a rich part of our memory banks. Traditions form part of that, with classic dishes at holiday time and family favourites forming a part of your young palate. As you grow and travel, more flavours are added, and the experiences you share around a table throughout your life become a very important part of who you are. If you’re like me and other gourmands, those memories become something you cherish and work to share as a passion. 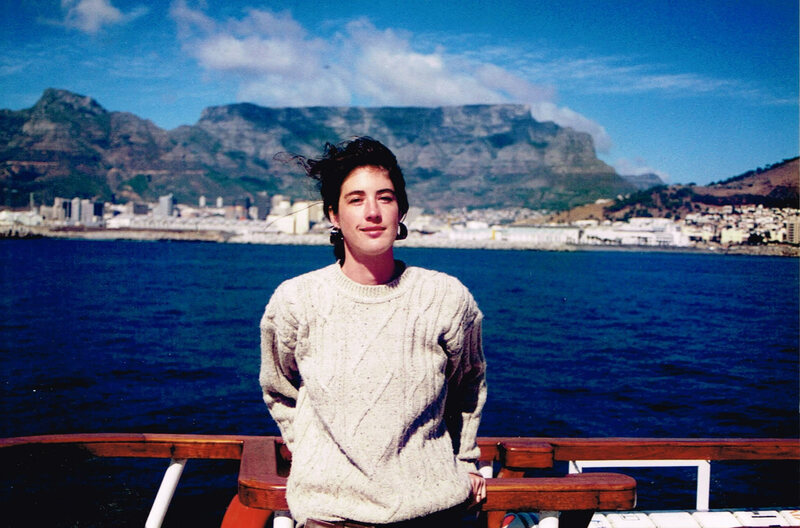 My trip to South Africa many years ago when I first met Julia and reunited with her mom, one of my first travel companions, is one of my favourite experiences for many reasons, food being a major one. South Africa is a nation rich with food history, being a conglomerate of so many cultures. Its position as a central point in the Dutch spice trade in the 17th and 18th centuries enhanced its exotic nature, as ships brought all manner of foodstuffs to the settlers who had come with their own cultures. Europeans from the Netherlands, France, Belgium, and Germany came and contributed their food and wine cultures full of cream sauces, stews, roasted meat and more. Then there were the Malays with tastes reminiscent of India, full of aromatic spices and hot curries. The abundance of seafood combined with the range animals settlers encouraged provided a rich bounty and the cuisine flourished with all manner of flavours. I tasted cured meat called biltong, a variation on our beef jerky that is wonderful. I had fish that I had never seen or heard of before, under a starry sky that contained constellations unfamiliar to me as well. Such is the thrill of eating in another hemisphere. I savoured Cape Brandy Pudding at the top of Table Mountain, and felt as though I had received a worthy prize for my efforts indeed. I also had the simple Milk Tart and could imagine the simple life of early Dutch farmers working the land. 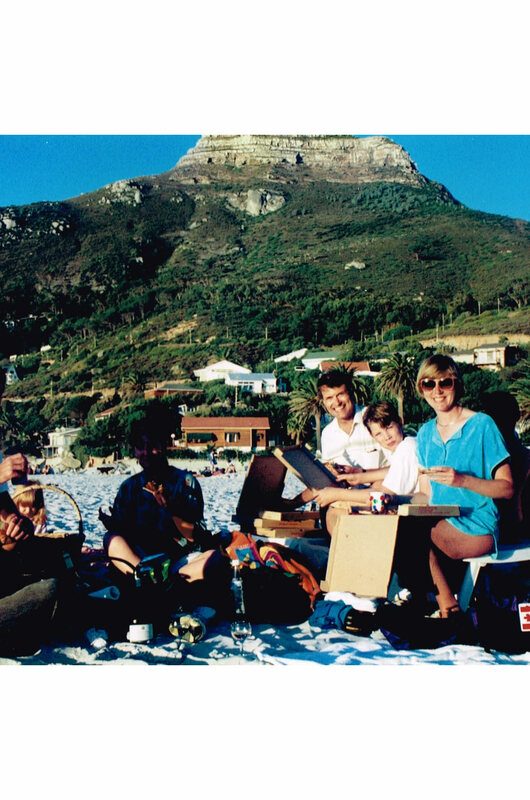 Even picnics were incredible in a new country – I had pizza and local wine on the beach at Cape Town and dipped my toes into the South Atlantic Ocean for the first time. Food on a paper plate never tasted so good! 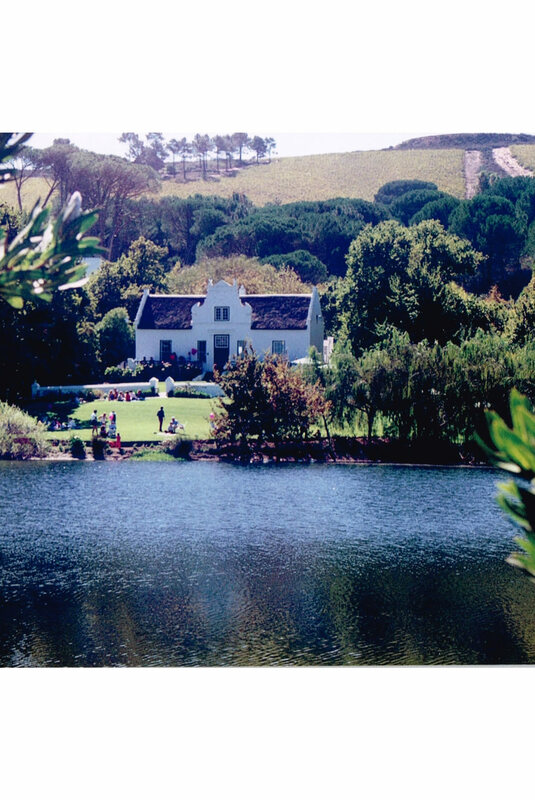 We went wine touring as well, and had a picnic at Boschendal wine estate, on sprawling grounds with ponds, geese and beautiful shade trees. Of course, anyone who has travelled and eaten a special meal knows of what I speak – the same food never tastes as magic as it does in the midst of that memory. But the thrill of new memories sends us out again, back to old haunts and in search of new ones. I shall see my pal and my goddaughter again this spring, when I visit them in the U.K. for Julia’s 21st birthday party and her parents’ 25th wedding anniversary. Nearly 30 years of friendship across the planet will also be celebrated, and I’m sure I will have more recipes to add to this collection! I’ve always wanted to see the New England states, doing a bicycle tour. A bit of Maine lobster, perhaps a New Hampshire breakfast, and of course a whoopie pie! 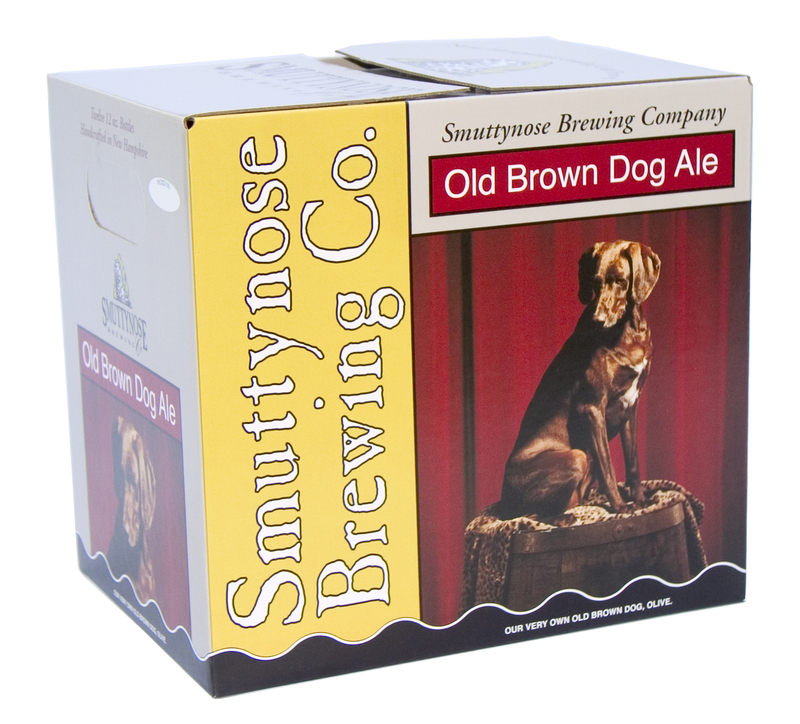 And who wouldn’t want to try a Smuttynose beer? 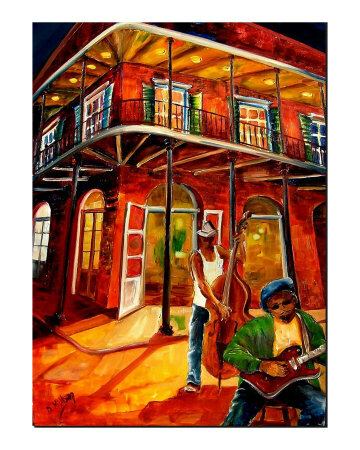 I love convivial music, and seafood, and a bit of spice, so The Big Easy (New Orleans) is definitely on my bucket list. 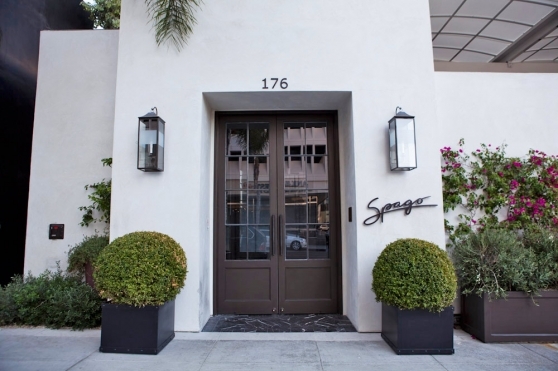 I have read about popular chefs and their restaurants for decades, and one place I have still never been is Spago. Wolfgang Puck is a kitchen icon who has survived a long time in a fickle world. It’s just so quintessentially LA, don’t you think? Although I’m not a fan of haggis or salt cod, I would like to visit the countries of my heritage – Scotland and Iceland – and enjoy at least some of their specialties on home turf. 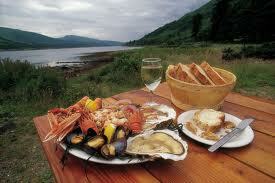 Lunch in the Highlands, anyone? 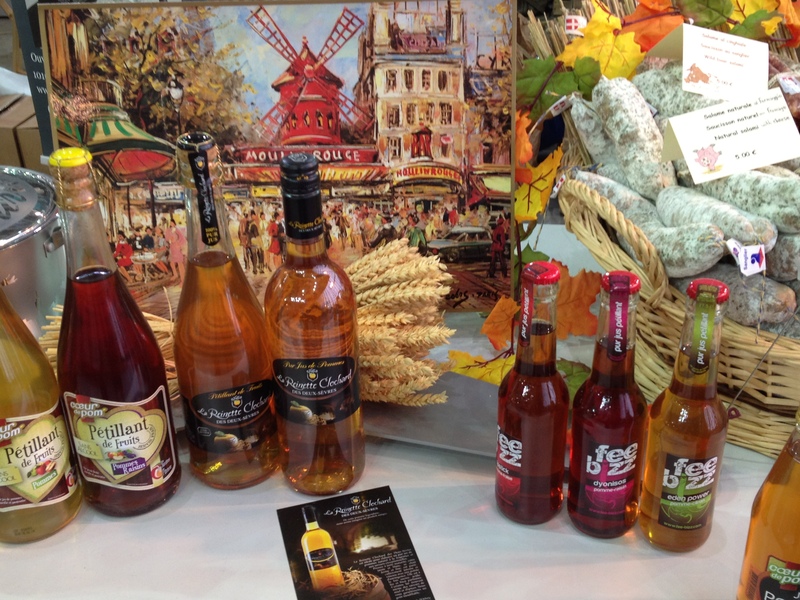 Who knew there were so many specialty foods so far north? 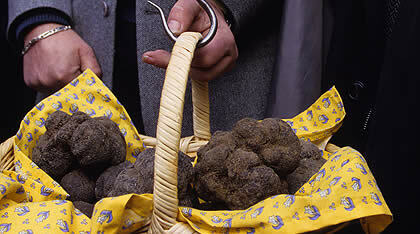 I want to go truffle-hunting. I have hunted for chocolate truffles in France 🙂 but never black truffles in Italy. I got to eat them in Turin last month as part of the truffle festival, so now I just want to see them in their natural habitat. I like travelling because I get to experience different cultures, and a large part of culture has to do with food. Markets showcase specialties, and meal formats are linked to climates and family structure and business patterns. When I share those experiences in a new place, I feel privileged. I enjoy the kinship that comes from the humble sharing of food at a table. Of course, even at home that can be special. Sharing a meal with friends and family always creates new memories, and this time of year is especially good for that. We will be hosting our yearly dessert party for neighbours and friends in a couple of weeks, an event that always warms my heart. Deep down, I guess my bucket list is about sharing happy times with others, and often that happens through food. Do you think I’m crazy or obsessed? Do you dream about great meals too? I’d love to know if I’m the only one who sees the kitchen as the centre of the universe. I was fortunate to attend a gathering of people who share a common passion – enjoying food. This may sound like any other dinner party you’ve been to, but imagine if you will a party of about 5,000 people. We didn’t speak the same language, we came from all walks of life and corners of the world, but we could enjoy sharing a taste of food because we all believed that everyone deserves to enjoy good food. We all believed that we are each responsible for taking part in our food community. The gathering I attended is called Terra Madre. 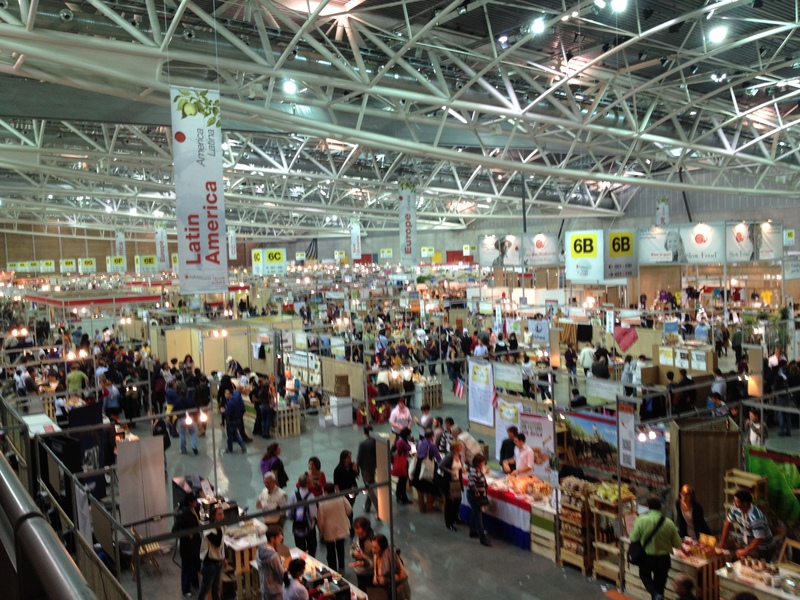 It is a conference organized by the food communities that belong to Slow Food; there are 2000 of them around the world, representing over 100,000 members. It’s a chance to share ideas, learn new information and go back to our communities energized with ways to make a positive change. Not to mention we tasted all kinds of food from around the world! More than anything, this was about the experience that food can create in our lives. Sometimes the talk was of “edible education” – the importance of teaching children about the pleasure of good food that is sustainable and wholesome. Other sessions discussed keeping traditions alive by sharing the stories of food and maintaining them in the environment and in the culture. Still others delved into the politics of sustainability and hunger. There were panel discussions that offered many points of view but many of my most powerful memories are of conversations I had with other individuals, or interactive experiences. There was effort made to ensure we enjoyed our food, from the way it was prepared to the venue and atmosphere in which we consumed it. different kinds of grains grown around the world … there are 15 kinds of millet alone! I took part in a bread-making session held by a family that has produced bread in their region for 4 generations. I don’t speak Italian, and the presentation wasn’t offered in English, but I could understand the gist of it. They spoke of their passion to flavour the bread with whole grains, milled fresh, and herbs in season. They spoke of the character of the bread, the sense of place it offered in its taste. They were proud of their work, and happy to share the secret with others. They even sang about it! 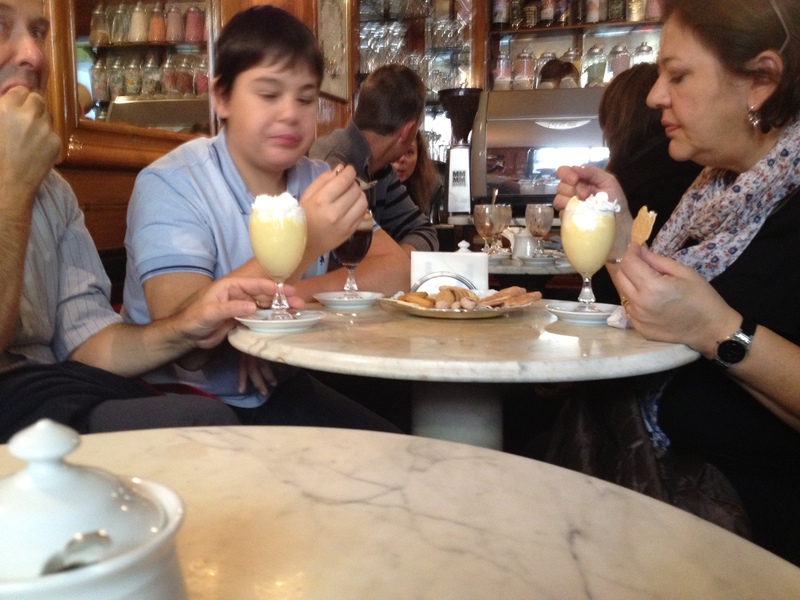 I sipped a special drink that was invented in Turin, called a Bicherin, in the cafe where it was first created. This delectable combination of chocolate and coffee with full cream on top was designed to offer sustenance to those enduring the long church services at the basilica across the piazza. 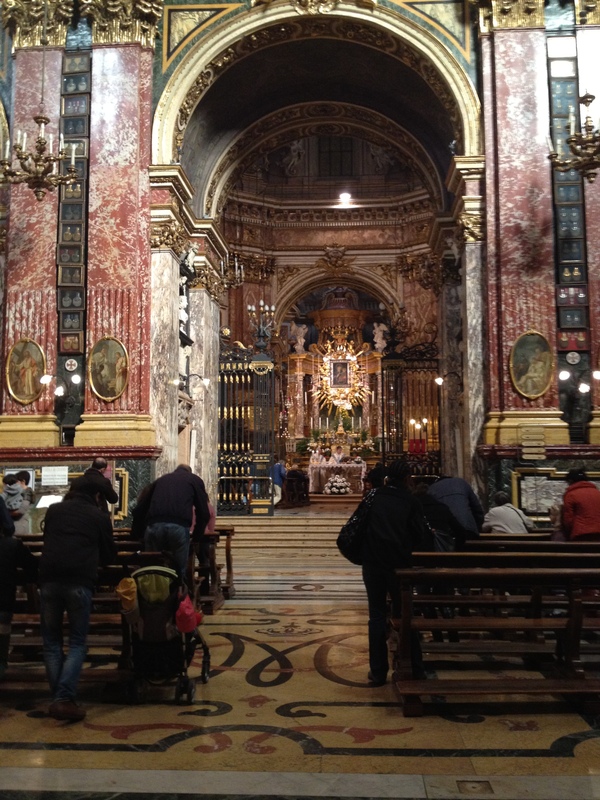 The parishioners would sneak out to the cafe and down a drink so as to be able to make it through the entire service. We lingered and enjoyed a biscotti with our beverage, just like the locals at the next table. 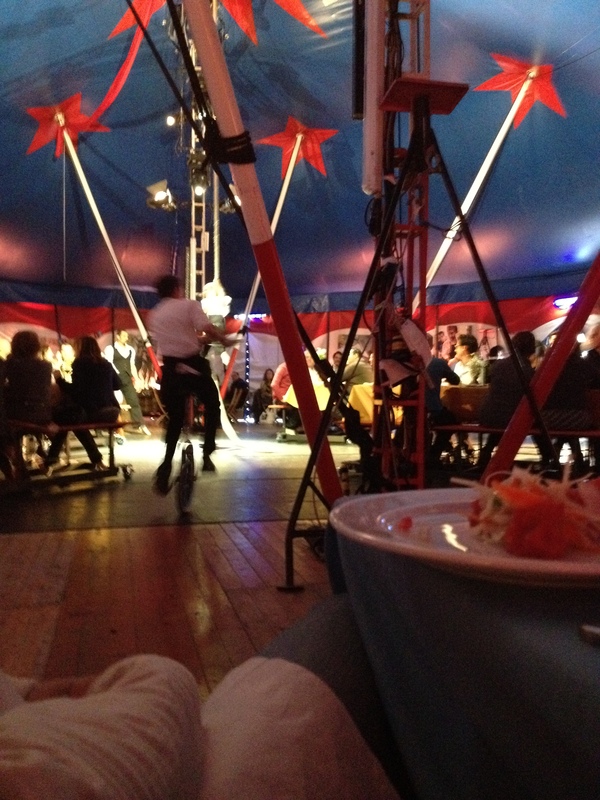 performers delivered salad on unicycles! I had a lunch that offered local ingredients prepared by local chefs. There was salami and cheese from local producers, regional wines, a risotto made with a special cheese that has layers of flavour from different batches that are stacked on one another in a pyramid, and a dessert of candied beets and persimmon “pearls” in local ricotta.This meal was experienced in a circus tent, allowing the flavours to unfold at the same time as the story of two young performers who fall in love and celebrate on a rope trapeze, while another is jilted and performs an angst-ridden acrobatic routine in a giant spinning hula hoop. In the background, a gypsy band played mournful accordion and guitar. Art, music, food and wine – this was an integrated experience, to be sure! If ever I was unsure about the importance of enjoying food and how much it can galvanize relationships and create a sense of community, this trip convinced me. I think that is the secret to teaching people who have not discovered this magic: don’t just feed them, share the food with a smile or a touch or a story. Remind them we are all connected, and the food is one of the most basic ways we stay connected – to each other, to our community, to the planet. 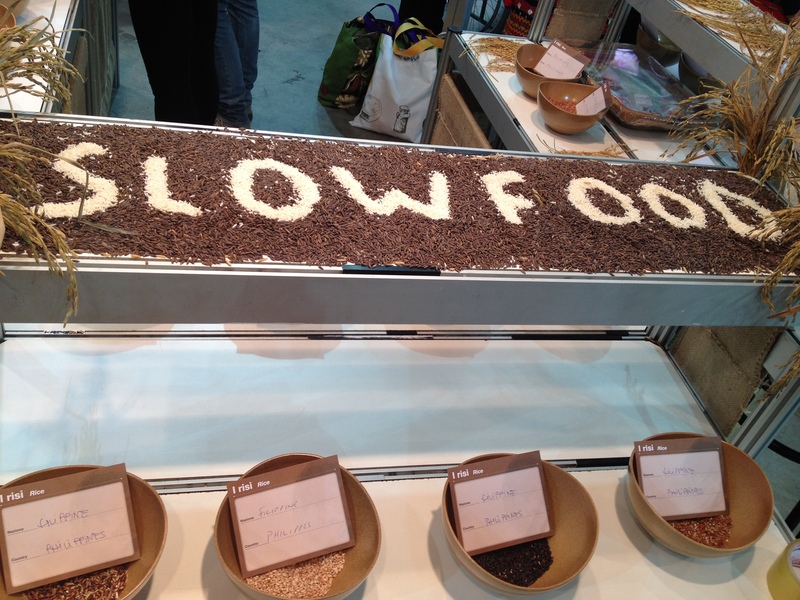 Slow Food is about everyone’s right to good, clean and fair food. Access to food is a right, not a privilege, but as aware consumers we must also remember that our part is a commitment to the community and the environment. We must each work to maintain those connections. It’s a job I relish! 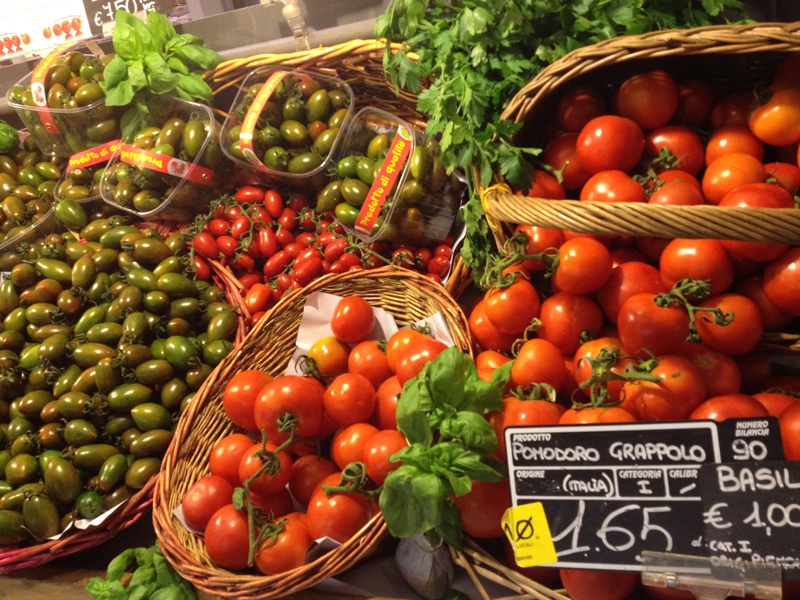 fresh heirloom tomatoes at Eataly, a local co-op store that features only items from Italy. There are now branches in Tokyo and New York. To see more photos and experiences from Terra Madre, check out the photo galleries on the Slow Food International website.